In Japan, the fastest-ageing society in the world, we explore surprising and innovative ideas for living better in old age. Japan has the fastest ageing society in the world with more than a quarter of its population over the age of 65. It currently has 66,000 centenarians, more than any other country. Toshiko Katayose and Aki Maruyama Leggett explore some of the innovative ways in which Japanese people are adapting to living longer. For over 20 years Toshiko Katayose edited Japan’s most popular magazine for senior readers. Now 67 and facing retirement, she reveals how her generation of baby-boomers born after World War Two, are overturning stereotypes about old age and how businesses are responding to these more demanding silver consumers. 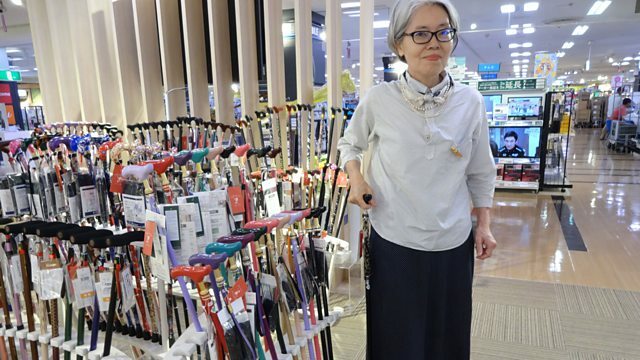 She visits Japan’s first supermarket built specifically to serve older shoppers which offers everything from crystal-studded walking sticks to try-before-you-buy coffin experiences.